Hey Everyone! So today I wanted to do a bit of a different post to normal from personal experiences. I want to start talking about more things I'm passionate about and things that I consider to be really important on my blog instead of just the beauty posts I'm churning out. 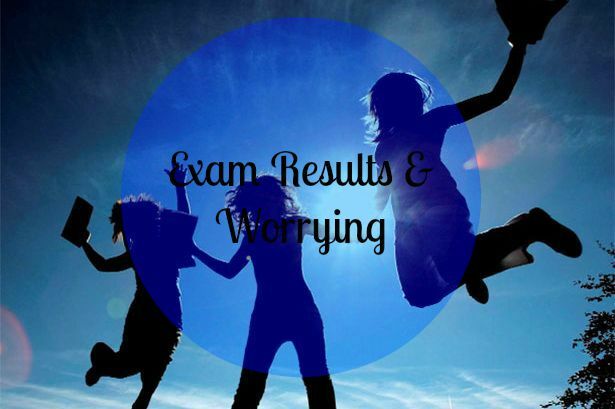 As it's that time in the summer season where lots of students are getting exam results I want to talk about how they are not the end of the world if you don't get what you wanted. This post is drawn up from personal experience so I hope you will enjoy reading it. I turn 24 years old on Monday. That means I finished my GCSEs eight years ago. (2007) and trust me it really scares me saying that as I still feel like a 16 year old student at times. During my final GCSE year I spent more time trying to get the attention of a guy who had absolutely no interest in me and spent the time trying to fit in with a group of kids in my year who basically treated me like dirt. I've always had parents who were really strict and therefore did not let me go out so I guess you could say I rebelled a little bit as I just didn't want my life to be constant work even though I did work hard and spent a lot of time revising and studying with friends and neighbors. When it comes to exams I'm one of those people who no matter how hard I study at something or work at something, the minute I step into an exam hall it all goes out of my head and I go into a state of panic purely because I'm overthinking and worrying too much instead of stepping into the hall and doing the best I start. My hard work just never ever seemed to pay off when I was studying in school. I'm a massive worrier anyway so nothing really puts my mind at ease however the older I've got the easier it's been to calm myself throughout exam situations. I received my GCSE results in the summer of 2007 and sadly they were not what I expected. I didn't do well at all and ended up having to resit the entire year. I know what you're probably thinking. 'That sounds awful'. In actual fact it ended up being probably one of the best years of high school. There was a small group of us who had to resit that year including two of my best friends but we made sure to buckle down and work hard whilst making sure we also had fun. If there's one year I remember from high school it was definitely that year. It was incredible and we all ended up passing. which was amazing! After this I decided that I really wanted to do A Levels but sadly I had a teacher who refused to let me back in. My parents and everyone booked meetings and did everything they could to get me in but it just wasn't happening and I was devastated because I really didn't want to have to go to college and leave all my friends behind. Because I'm a very shy, anxious person who always worries what people think of me I don't find it the easiest to make friends. I just didn't want to have to meet new people again, It scared me in a way so I really didn't know what was going to happen. The school still wouldn't let me back so I was a little upset about that as I wanted to go to university and I wasn't sure if I would still be able to do that if I was to go to college. However I ended up passing everything I retook and was incredibly happy and was able to finally move forward with my life. During my retake year one of the subjects I studied was Double Award Leisure and Tourism. I absolutely loved it and from a young age was always interested in the tourism industry and really wanted to work for a major travel/tourism company. I was unaware of different courses offered at colleges and I had absolutely no idea that you could actually specialize in one subject so once I did my research with my parents I opted to do a BTEC National Diploma in Travel and Tourism which I absolutely loved. I ended getting a Distinction Distinction Merit (DDM) at the end of the course which I was incredibly chuffed with. I also got into 4/5 of my university choices as well! I unfortunately didn't get into my first choice which was Surrey University because my predicted grades were not what they wanted. They were looking for a DDM which as know now, I did end up getting and I did email them but it was too late so I ended up going to St Mary's University in Twickenham which was amazing and I don't regret any of it and ended up graduating with a second class honors degree which again made me so happy. Fast forward 2 years since graduating and I've managed to work for two incredible tourism companies. Thomas Cook last year and British Airways this year. When I got my GCSE results on that cold day the day before my birthday I was devastated. However everything happens for a reason. If you told me back then I'd be working for one of the best companies in the travel and tourism industry I would have laughed in your face. What I learnt from my experiences is that I was still able to get to where I wanted to be, it just meant that I had to work a little harder. So if you didn't end up getting what you wanted please do not beat yourself up about it. Look at all available options. See what you can do and speak to everybody you can think of to help you get there. If you want to get somewhere and are truly passionate about something then all you have to do is prove that by working a little harder and you can fulfill any one of your dreams. If I can do it, then you definitely can do it. You are never too old to resit a year or go back into education or study for anything. It may not be the way you thought you'd get there but we all write our own destiny and if you are passionate enough about something then you will do whatever it takes to get there. This post was longer than expected but I'll end it here by saying Congratulations to those of you who ended up getting the grades you wanted and for those of you who didn't get the grades you wanted I hope this post has made you feel a little bit more at ease and helped you realise that just because you haven't got the grades you wanted, it in noway means you can't achieve what you want to in life. If you want to talk or want some advice feel free to email me or tweet me over at xbellefleurx. If you want an advice post on college options/uni or anything like that then leave me a comment below and I'll get working on that soon! What will you be doing this coming September? This is just the post I needed haha, I didn't do as well as I hoped with my AS results, so I need to retake the year! This has definitely put me at ease now, thank you~!